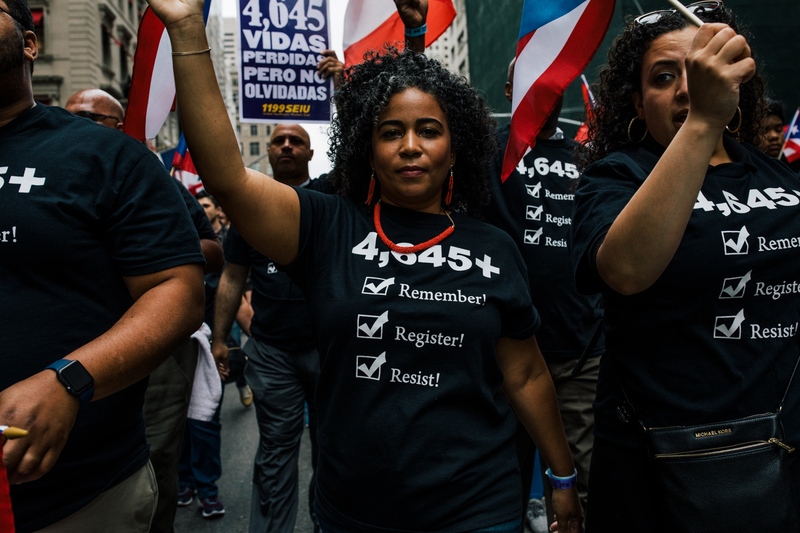 A marcher holds a sign displaying the numbers “4645,” referencing a recent study on the deaths caused by Hurricane Maria, at Fifth Avenue and East 76th Street. 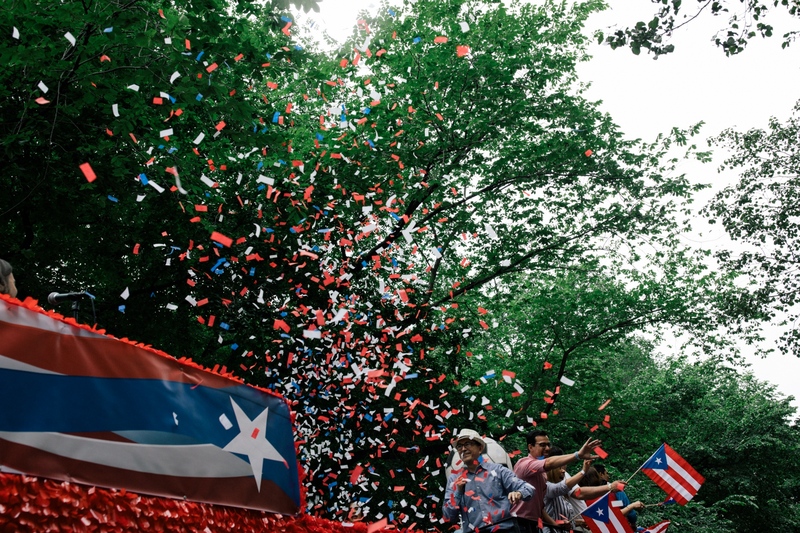 On an overcast Sunday, hundreds of thousands of people gathered on Fifth Avenue to express their love for la Isla del Encanto during the 61st annual Puerto Rican Day parade. 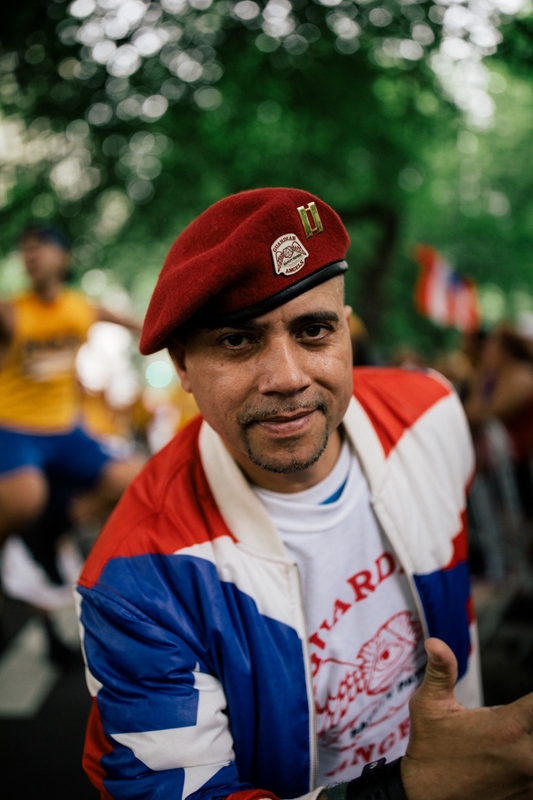 With Puerto Rican flags waving everywhere, and an occasional rain that pattered onto the sidewalk and tree limbs, New York City felt as if it had been transformed into the Caribbean island, where one could sit on a relative’s porch and watch a passing storm. On Fifth Avenue, paradegoers sang traditional songs and danced. But the mood was somber too. 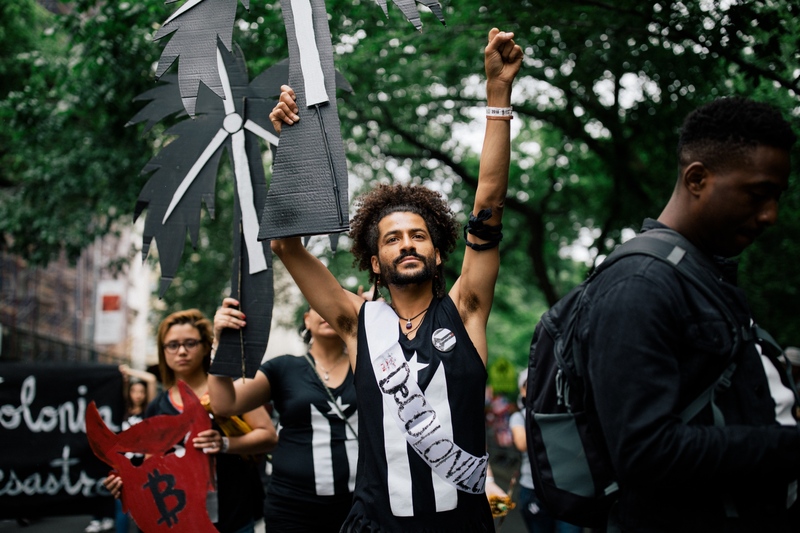 Many had come not only to celebrate their heritage, but also to protest the deteriorating conditions in Puerto Rico that are a result of Hurricane Maria, and what they consider to be a lackadaisical response by the federal government to the catastrophe. 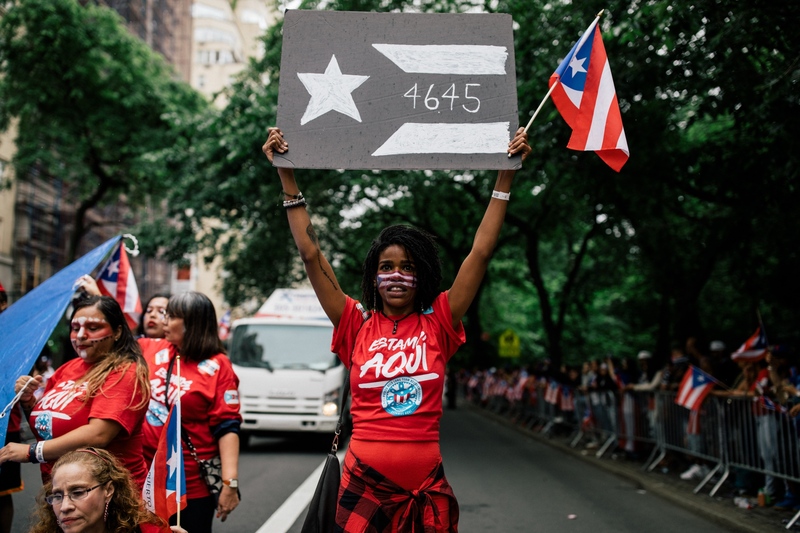 Over the parade route’s thirty-plus city blocks, many held signs that simply read “4645,” a reference to a recent Harvard study that estimated the number of deaths from the hurricane. (The number 4,645 is actually the midpoint in a possible range of deaths; based on a sample survey, the study extrapolated that the death toll could be as low as 793 and as high as 8,498. The federal government’s official death tally, meanwhile, remains at 64.) 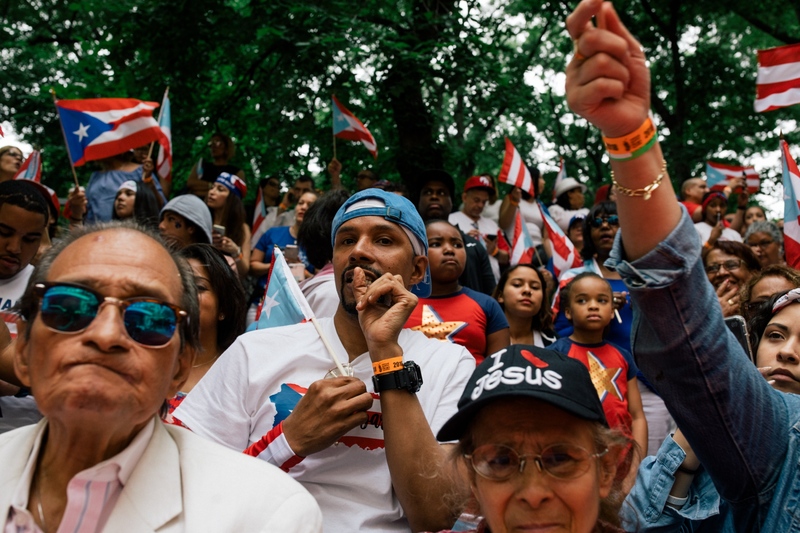 With the country watching and Héctor Lavoe blaring from speakers, marchers with heavy hearts shared with fellow Americans the beautiful qualities of Puerto Rican heritage that Hurricane Maria couldn’t destroy. The hope is to bring awareness, and perhaps build a better understanding between the mainland and the island to create a more prosperous future. Que bonita bandera. 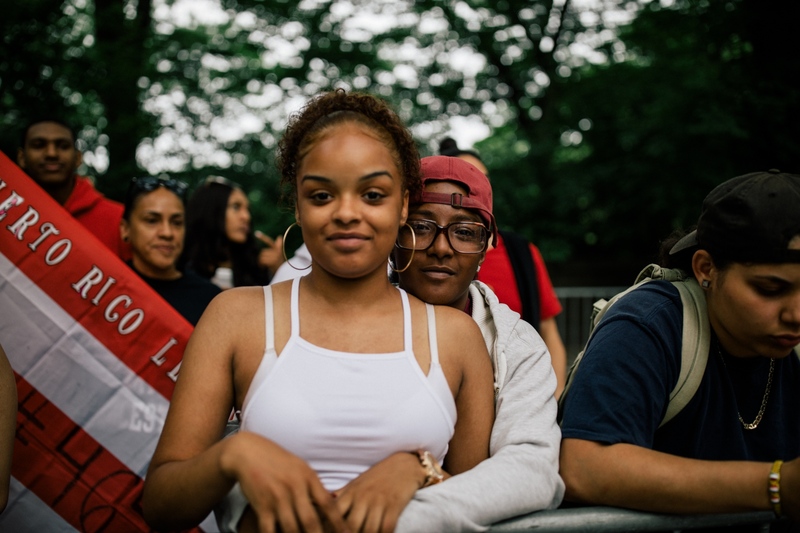 Crowds stand pressed to the blockades placed by the NYPD to take in the celebrations at Fifth Avenue and East 69th Street. 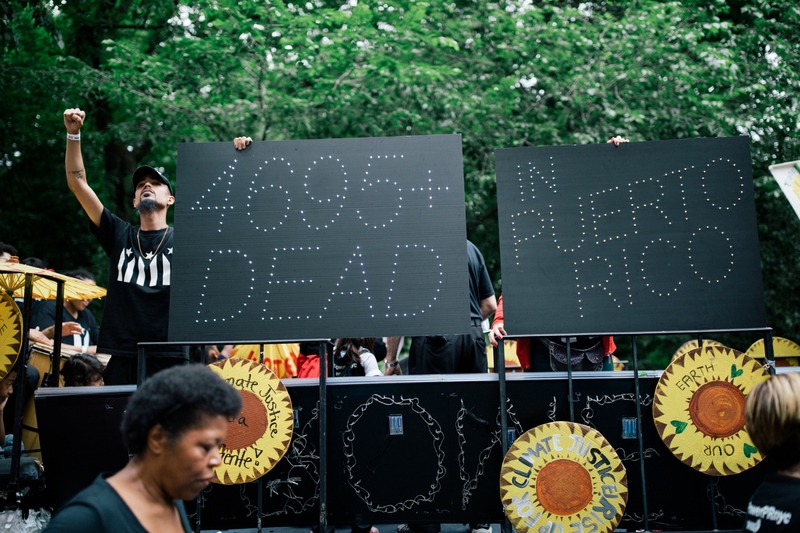 The Climate Justice Alliance and Our Power Campaign chants its vision for a more green world, and displays the numbers reflecting an estimate of the death toll from Hurricane Maria. 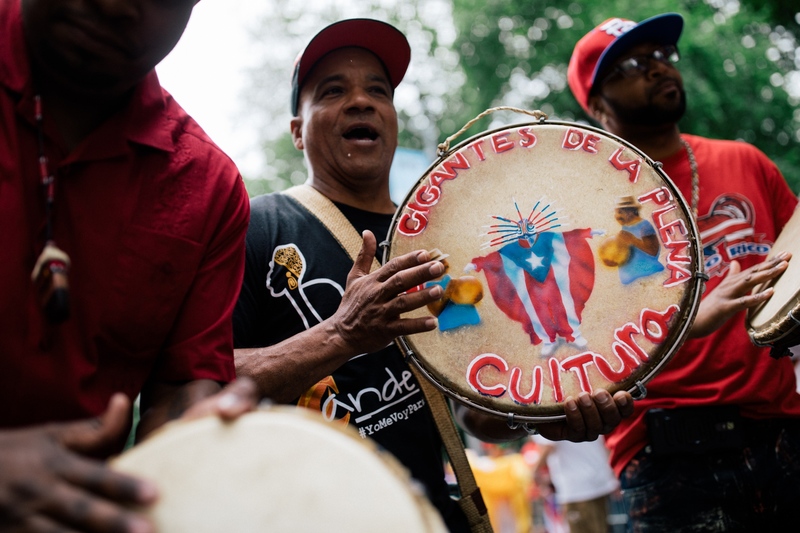 The music group Los Gigantes de la Plena play bomba, a traditional style of music that revolves around percussion, at Fifth Avenue and 75th Street. 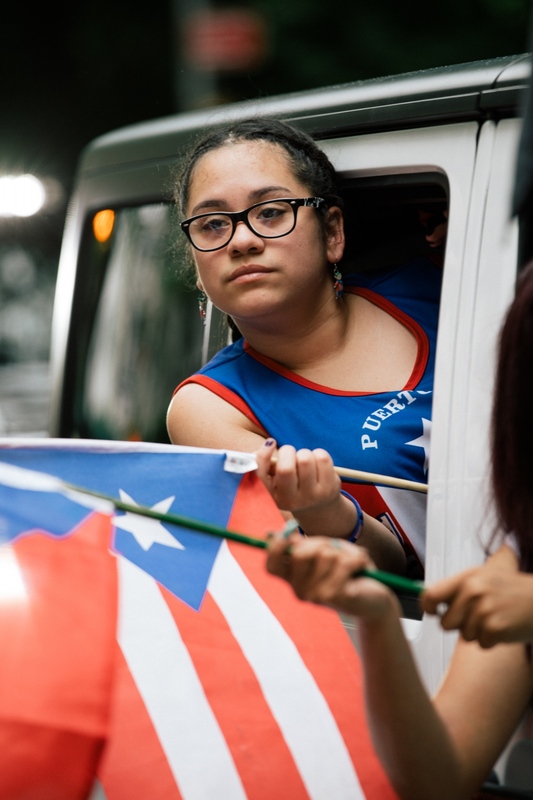 Marchers walk down Fifth Avenue waving Puerto Rican flags and chanting to the crowds. 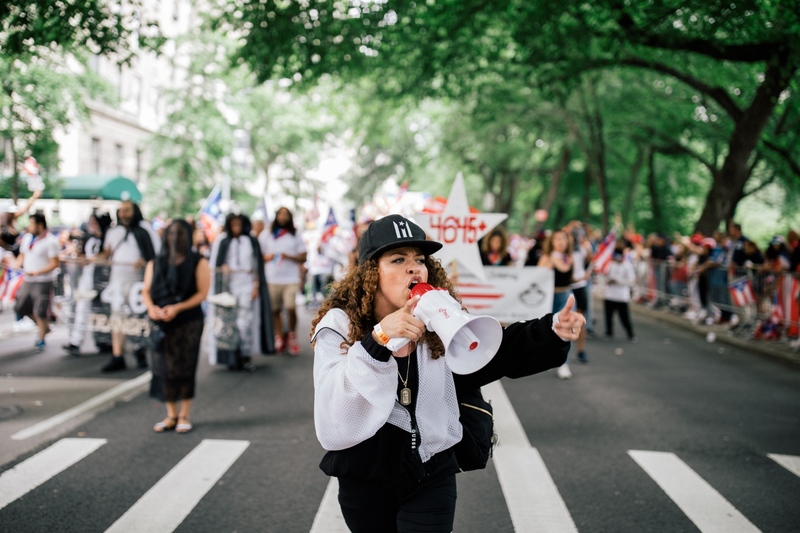 Members of Community Solutions march in solidarity with those impacted by Hurricane Maria, and voice their beliefs with the help of a megaphone, at Fifth Avenue and 76th Street. 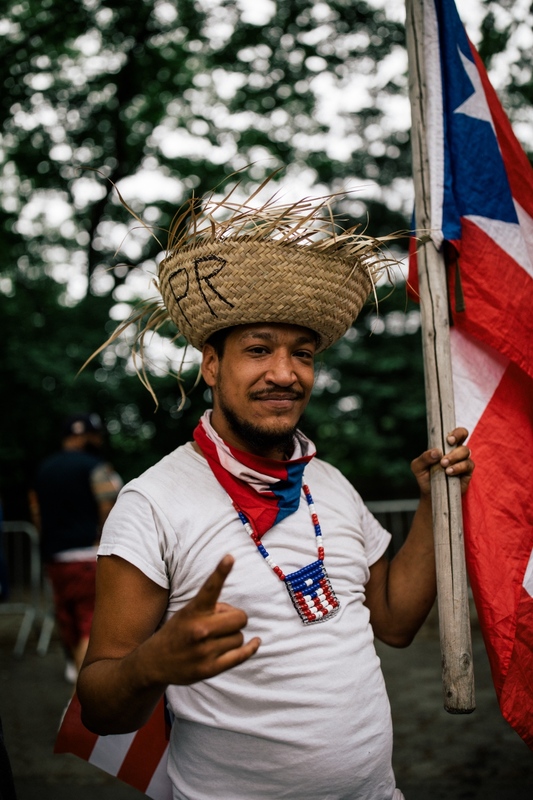 A member of the crowd holds a Puerto Rican flag and traditional Jibaro hat at Fifth Avenue and 76th Street. 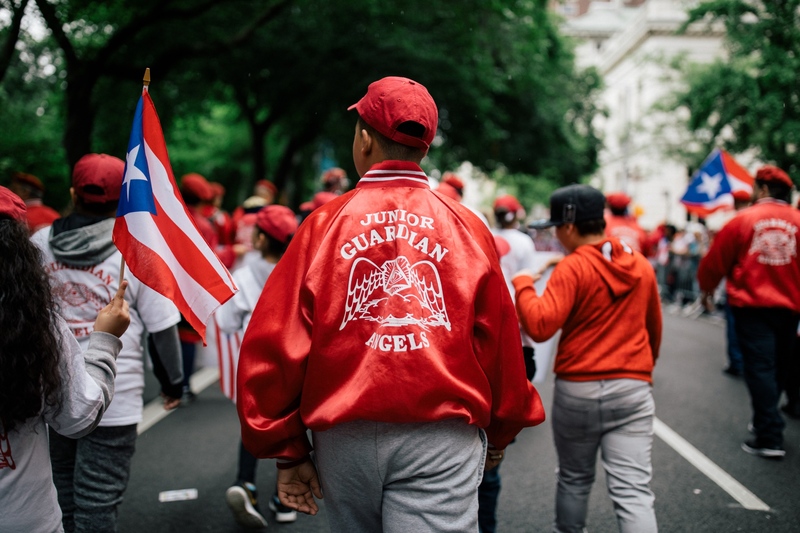 Junior members of the Guardian Angels Florida Chapter excite the crowds as they make their way up Fifth Avenue. 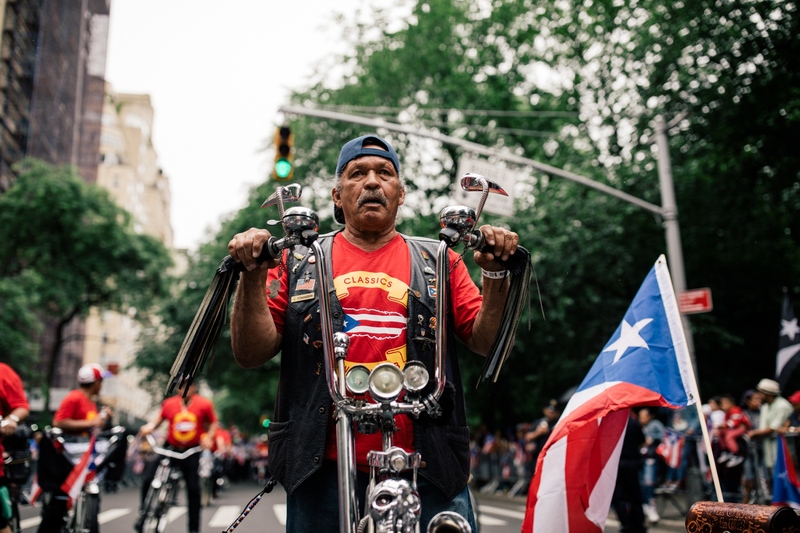 Members of the Bronx Classic Bike Club display their custom bikes at Fifth Avenue and 76th Street. 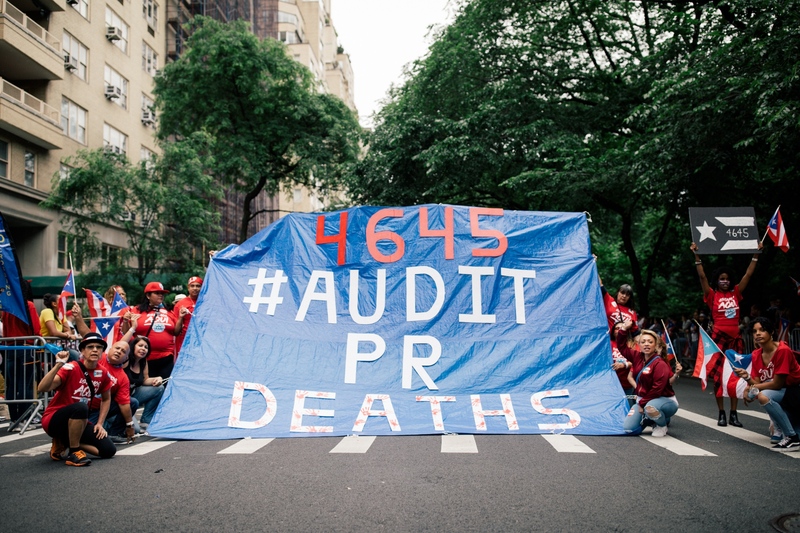 Marchers stop the parade briefly to hold open a large tarp displaying the midpoint of the newly released death toll estimates on Fifth Avenue and East 76th Street. 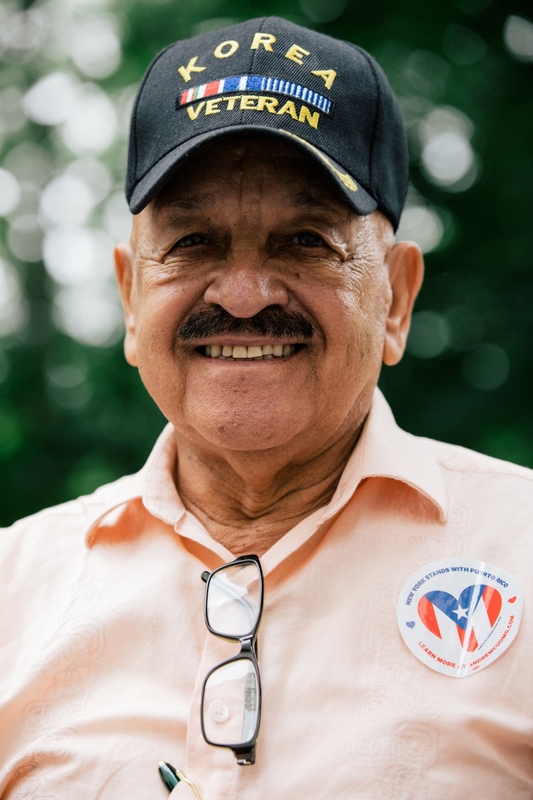 Marchers led by Rubén Díaz Jr., Bronx borough president, voice concerns about the recent death toll estimate and encourage the crowd to register to vote as they march on Fifth Avenue. 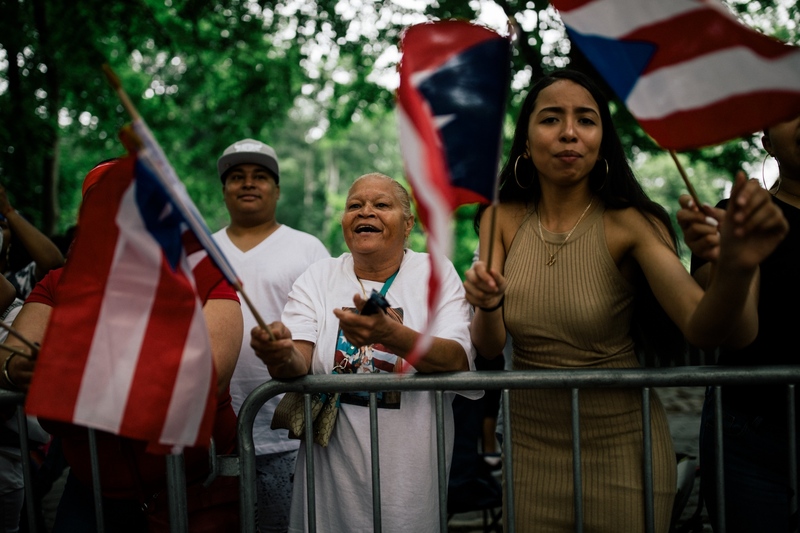 Crowd members chant and wave their Puerto Rican flags at marchers at Fifth Avenue and East 74th Street. 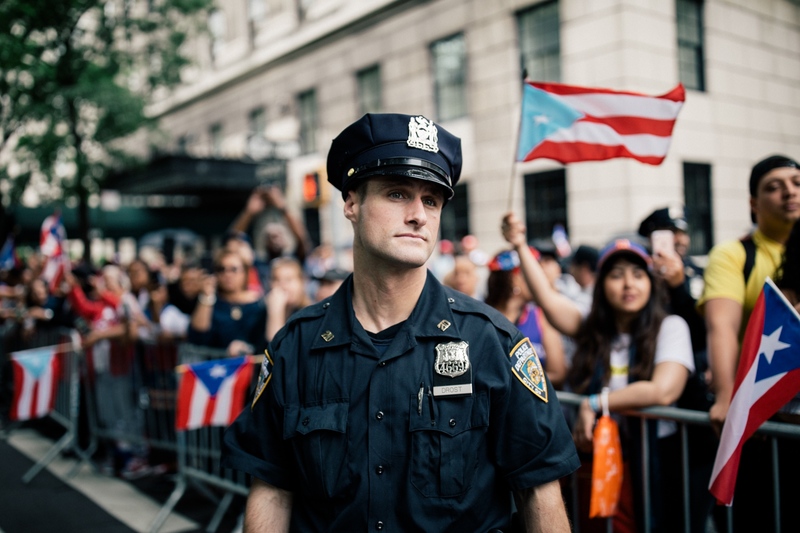 NYPD Officer Drost gazes down Fifth Avenue while Puerto Rican flags wave around him. 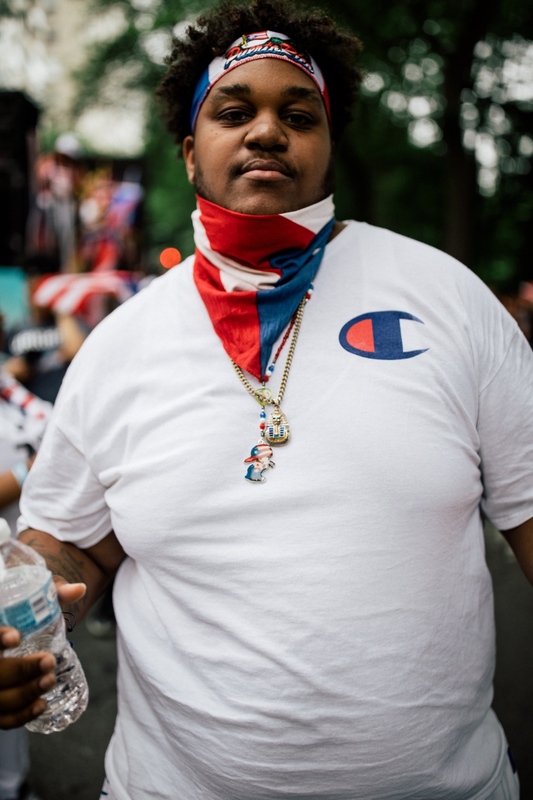 A member of Chicago’s Humboldt Park Jeeps looks out at the crowd from one of the many Jeeps at the parade while driving down Fifth Avenue. 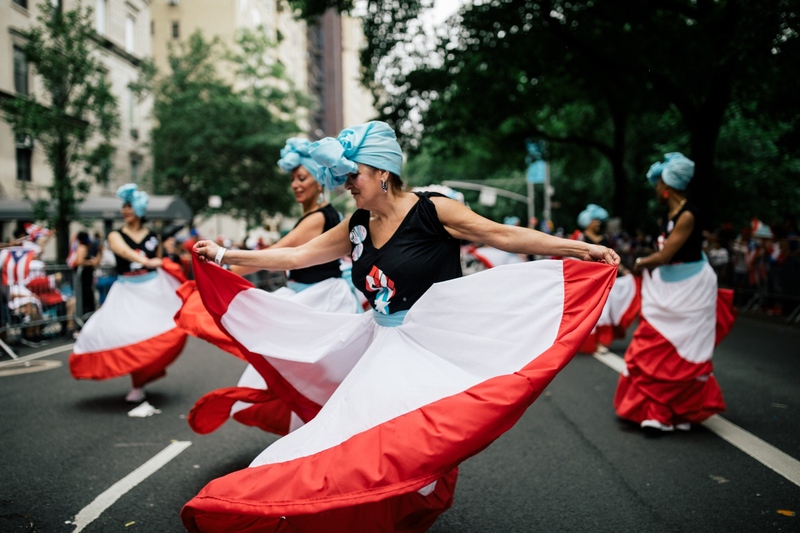 Members of New York State Nurses Association perform dances in traditional “bomba y plena” dresses on Fifth Avenue. 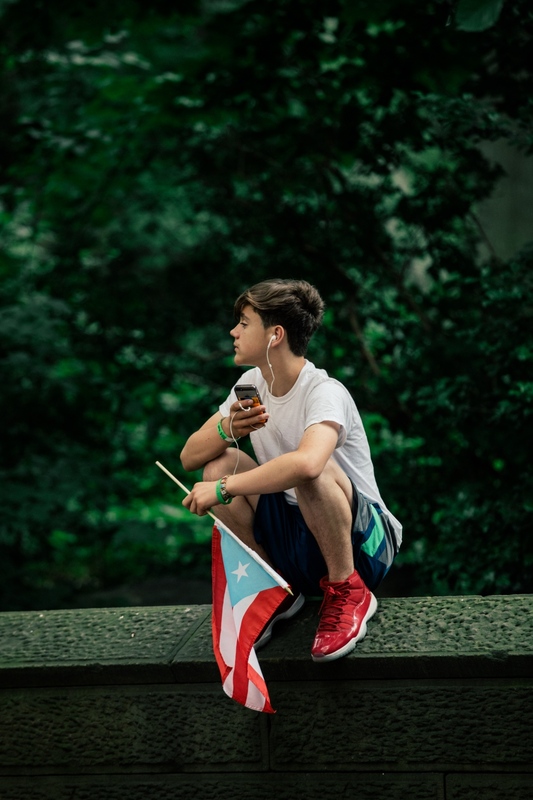 A young teen perches on the walls that surround Central Park to watch the parade. 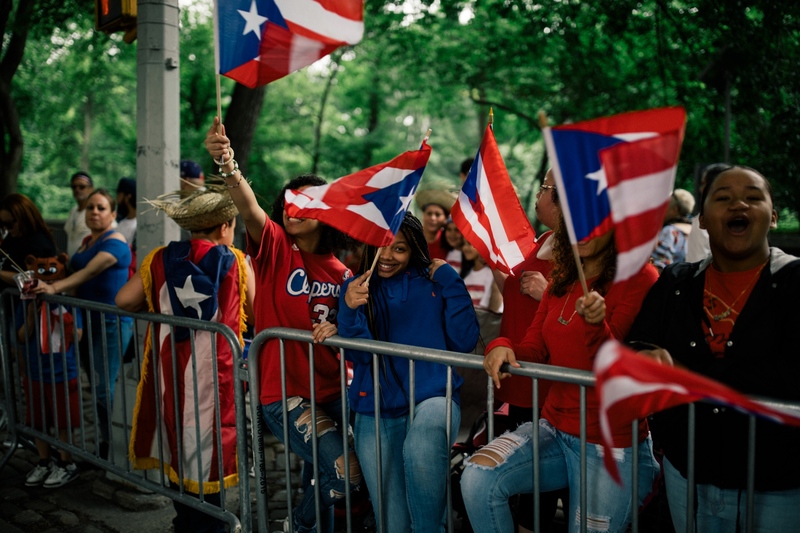 Crowd members take part in chants and wave their Puerto Rican flags at Fifth Avenue and East 71st Street. 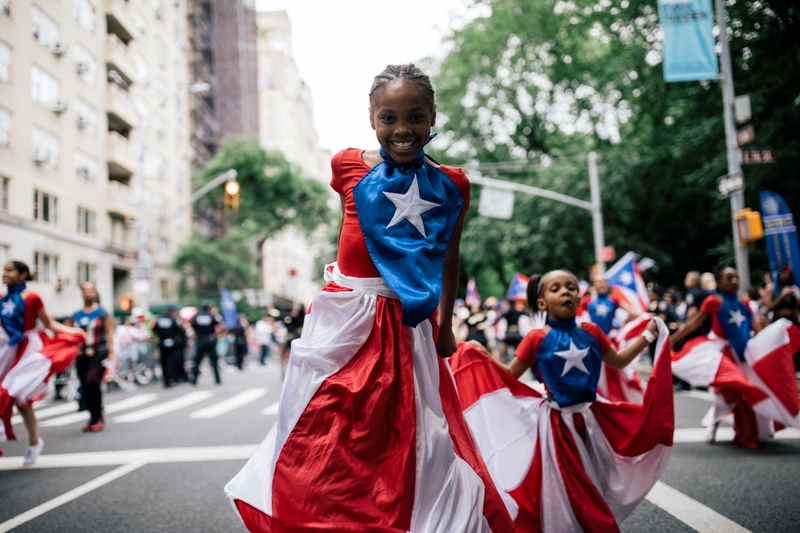 Young marchers dance for the crowds at Fifth Avenue and 76th Street. 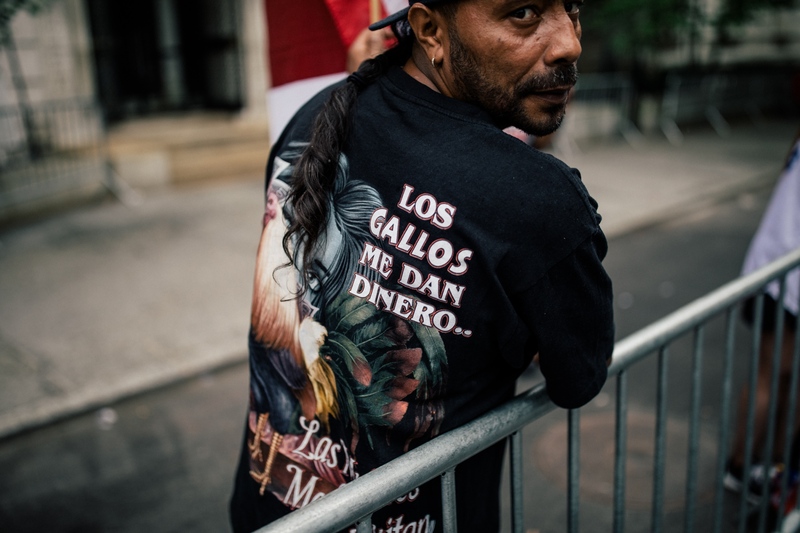 A crowd member displays a shirt that translates as “The roosters give me money,” at Fifth Avenue and East 72nd Street. Two women stand for a portrait at Fifth Avenue and 74th Street. 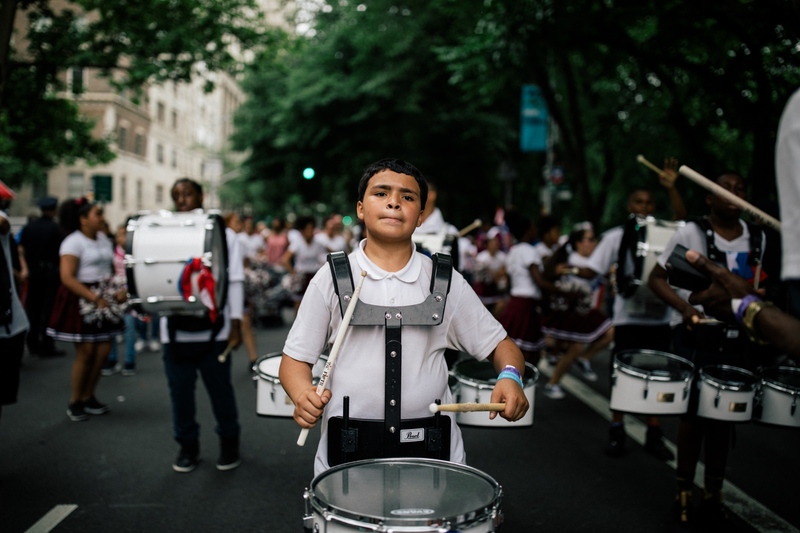 A young drummer plays the snare drum as he marches down Fifth Avenue. 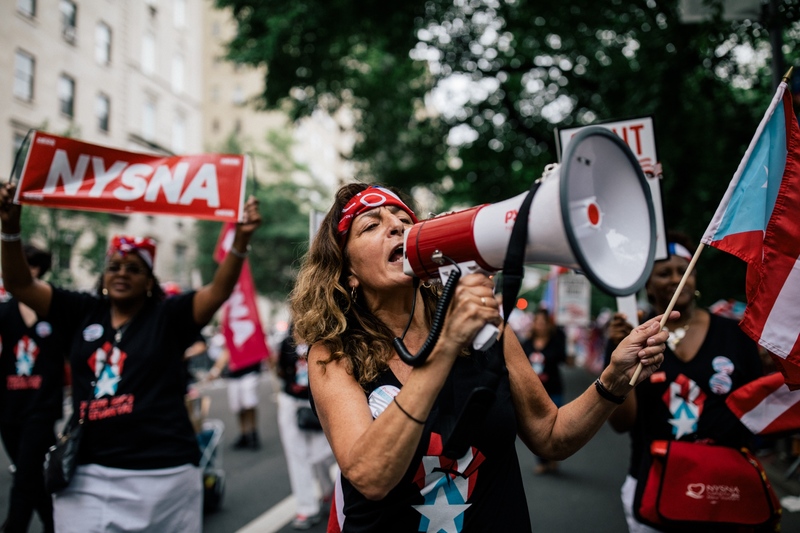 A member of New York State Nurses Association chants through a megaphone to the crowd on Fifth Avenue. 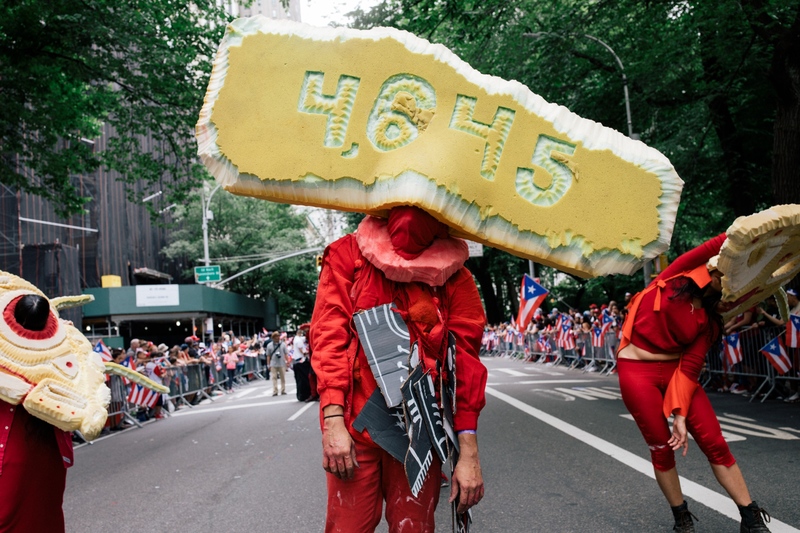 Puerto Rican performance art collective and sculptors Poncili Creación wear creations displaying the current estimated death toll from Hurricane Maria as the group dances down Fifth Avenue. 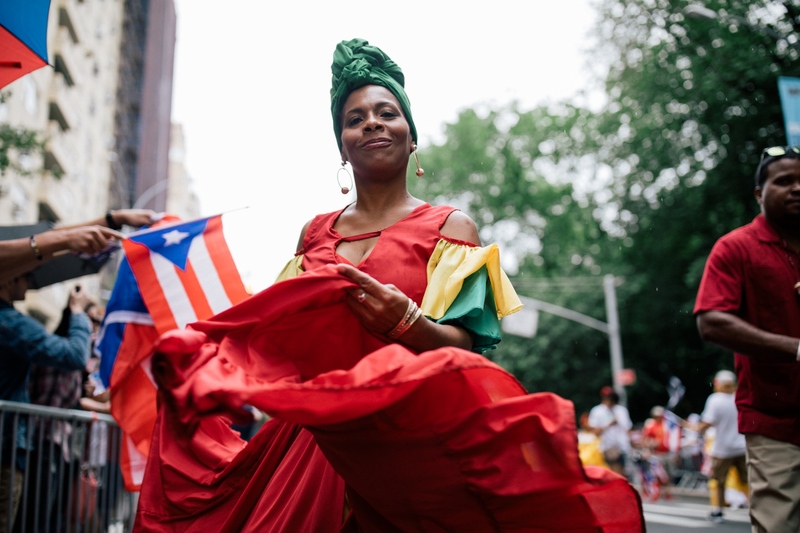 A woman in a traditional “bomba y plena” dress performs folk dances at Fifth Avenue and 75th Street. 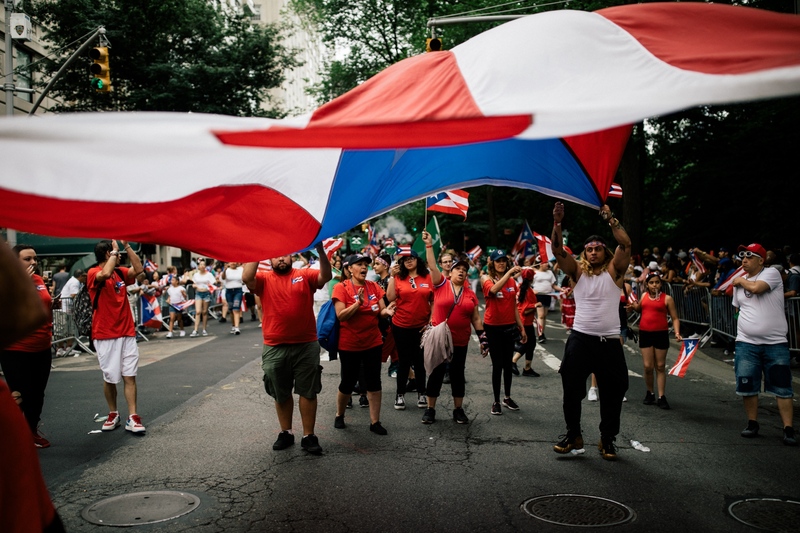 A float operated by the Spanish language channel Telemundo 47 releases confetti and hands out inflatable soccer balls at Fifth Avenue and East 61st Street.